The following guide outlines how Kristin Dittmar Design brand assets—including logos, colors, and typography—are to be used to ensure visual and brand consistency across various print and web communications materials. 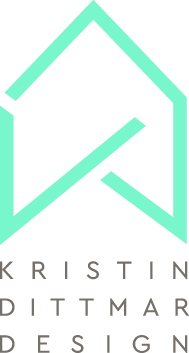 Creation, application or any use of the Kristin Dittmar Design brand assets must conform to approved standards as authorized by Kristin Dittmar Design. It is important that your communications materials use Kristin Dittmar Design approved brand assets correctly. This guide will help you meet those standards. Thank you in advance for reviewing, understanding and abiding by the contents and specifications provided in this guide. This artwork is solely intended for the promotion of Kristin Dittmar Design. Distortions, alterations or use of this artwork in ways contrary to the standards put forth in this manual are prohibited. Other than the fixed use of colors specified in this guide for the Kristin Dittmar Design brand assets, color selection for communications is open to any combination as long as the selections are from the Kristin Dittmar Design color palette. Colors may be used for backgrounds, as text, as borders or accents to graphic images or photography, etc. CMYK values are specific to print on desktop printers or off set printing. RGB values are specific to colors viewed on a monitor. HEX values are shorthand RGB values to be viewed on a monitor. PMS values are what most vendors will request for printing. Electronic FIles in AI, PDF, JPEG and PNG are available for print and web. Original art should always be used when possible. Kristin Dittmar Design primary typeface is Futura PT. This typeface should be used for headings (h1, h2 and h3) in web as well as headings for print. This is a strong yet elegant font perfect for interior designers. Kristin Dittmar Design secondary typeface is Proxima Nova. This typeface should be used for all body copy used in print or web. Several logo variations are available to use and have been grouped within folders based on their le format. These tips are provided to help you decide which le to use for general applications. These files are geared more toward designers. In most cases, you will probably not use these files, but you will want to give them to vendors for apparel, banners, signage, etc. They have the .ai and .pdf file extension. These should not be resized because the art will be distorted. Resize in an image editor program like Photoshop, save a copy to your computer and then import into your layout. They have the .jpg file extension which is not transparent and has a white background color or the .png file extension which is transparent and will allow any background color to show through.